Pathway Lighting Products, Inc. is excited to announce the release of CentralDriveTM, a system of low voltage LED lighting fixtures with drivers that are remotely located for easily accessible maintenance. 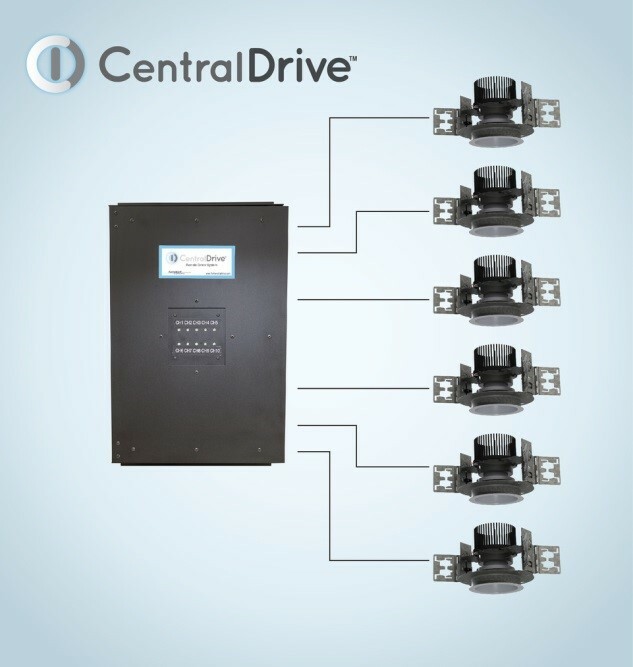 In the CentralDrive unit, line voltage connections, control electronics, drivers and all control and driver wiring are located in a wall-mounted panel. The CentralDrive panel can be located in an easy-to-access electrical and equipment closet and this panel can be located up to 200 feet from the LED fixtures. The only wires that go to the fixture are low voltage DC using only 18/2 shielded cable. The drivers and controls are now easy to access and away from the heat generated by the LEDs. This system configuration improves system life and eliminates the need for expensive lifts or scaffoldings to conduct occasional driver replacement in tall-ceiling and difficult to reach fixture applications. The ceiling can be free of both line voltage and control wiring with all associated conduits and or cable trays reducing system installation costs. CentralDrive comes with built-in output monitoring for fault diagnosis, and the front cover is equipped with LED indicators to communicate status of each of the 10 available output channels.